Ultimately the Ukrainians sought protection from the Germans with whom they negotiated a peace treaty at Best-Litovsk in 1918. Exacting a heavy economic price for their support the Germans duly took the Ukrainians’ side and obliged the Bolsheviks to accept an autonomous Ukraine. The Ukraine declared independence on 22 January 1918. Ukrainian people and all peoples of the Ukraine! An hour of trials and difficulties has come for the land of the Russian Republic. In the north in the capitals (Petrograd and Moscow) a bloody internecine struggle is in progress. A Central Government no longer exists, and anarchy, disorder, and ruin are spreading throughout the State. Our country also is in danger. Without a strong, united, and popular Government, Ukrainia also may fall into the abyss of civil war, slaughter, and destruction. People of Ukrainia, you, together with the brother peoples of Ukrainia, have entrusted us with the task of protecting rights won by struggle, of creating order and of building up a new life in our land. And we, the Ukrainian Central Rada, by your will, for the sake of creating order in our country and for the sake of saving the whole of Russia, announce that henceforth Ukrainia becomes the Ukrainian National Republic. Without separating from the Russian Republic, and preserving its unity, we take up our stand firmly on our lands that with our strength we may help the whole of Russia, and that the whole Russian Republic may become a federation of free and equal peoples. Until the Ukrainian Constituent Assembly meets, the whole power of creating order in our lands, of issuing laws, and of ruling, belongs to us, the Ukrainian Central Rada, and to our Government – the General Secretariat of Ukrainia. Having strength and power in our native land, we shall defend the rights of the revolution, not only in our own lands, but in all Russia as well. Therefore we announce: To the territory of the National Ukrainian Republic belong the lands where the majority of the population is Ukrainian: Kiev, Podolia, Volhynia, Tchernigov, Poltava, Kharkov, Yekaterinoslav, Kherson, Tauris (without the Crimea). The further delimitation of the frontiers of the Ukrainian National Republic, viz., the addition of part of Kursk, Kholm, Voronez, and the neighbouring provinces and districts, where the majority of the population is Ukrainian, is to be settled according to the organized wishes of the peoples. To all the citizens of these lands we announce: Henceforth in the territory of the Ukrainian National Republic the existing rights of ownership to the lands of large proprietors and other lands not worked by the owners which are fit for farming, and also to lands belonging to the royal family, to monasteries, to the Crown and to the Church, are abolished. Recognizing that these lands are the property of the whole working people, and must pass to the people without compensation, the Ukrainian Central Rada instructs the General Secretary for Land Questions to work out immediately a law for the administration of these lands by Land Committees, chosen by the people, until the meeting of the Ukrainian Constituent Assembly. The labour question in the Ukrainian National Republic must immediately be regulated. For the present we announce: In the territory of the National Ukrainian Republic henceforth an eight hours’ day is ordained in the factories and workshops. The hour of trial and danger which all Russia and our Ukrainia is now experiencing necessitates the proper regulation of labour, and a fair distribution of food supplies and a better organization of work. Therefore, we instruct the General Secretary for Labour, together with representatives of labour, to establish from today State control over production in Ukrainia, respecting the interests both of Ukrainia and also the whole of Russia. For four years on the front blood has been shed, and the strength of all the peoples of the world has been wasting away. By the wishes and in the name of the Ukrainian Republic we, the Ukrainian Central Rada, firmly insist on the establishment of peace as soon as possible. For this end we make resolute efforts to compel, through the Central Government, both allies and enemies to enter immediately upon peace negotiations. Likewise we shall insist that at the Peace Congress the rights of the Ukrainian people in Russia and outside Russia shall not be infringed in the treaty of peace. But until peace conies, every citizen of the Republic of Ukrainia, together with the citizens of all the peoples of the Russian Republic, must stand firmly in their positions both at the front and in the rear. Recently the shining conquests of the revolution have been clouded by the reestablishment of the death penalty. We announce: Henceforth in the lands of the Republic of Ukrainia the death penalty is abolished. To all who are imprisoned and arrested for political offences hitherto committed, as well as those already condemned or awaiting sentence, and also those who have not yet been tried, full amnesty is given. A law will immediately be passed to this effect. The courts in Ukrainia must be just and in accordance with the spirit of the people. With this aim we order the General Secretary for Judicial Affairs to make every attempt to establish justice and to execute it according to rules understood by the people. We instruct the General Secretary for Internal Affairs as follows: To make every effort to strengthen and extend the rights of local self-government, which shall be the organs of the highest local administrative authority, and until the establishment of the closest connection with the organs of revolutionary democracy, which are to be the best foundation of a free democratic life. Also in the Ukrainian National Republic all the liberties won by the Russian revolution are to be guaranteed, namely, freedom of the press, of speech, of religion, of assembly, of union, of strikes, of inviolability of person and of habitation, the right and the possibility of using local dialects in dealing with all authorities. The Ukrainian people, which has fought for many years for its national freedom and now has won it, will firmly protect the freedom of national development of all nationalities existing in Ukrainia. Therefore, we announce that to the Great Russian, Jewish, Polish, and other peoples of Ukrainia we recognize national personal autonomy for the security of their rights and freedom of self-government in questions of their national life, and we instruct our General Secretary for Nationality Questions to draw up in the near future a measure for national personal autonomy. The food question is the foundation of the power of the State at this difficult and responsible moment. The Ukrainian National Republic must make every effort to save itself both at the front and in those parts of the Russian Republic which need our help. Citizens! In the name of the National Ukrainian Republic in federal Russia, we, the Ukrainian Central Rada, call upon all to struggle resolutely with all forms of anarchy and disorder, and to help in the great work of building up new State forms, which will give the great and powerful Russian Republic health, strength, and a new future. The working out of these forms must be carried out at the Ukrainian and all-Russian Constituent Assemblies. 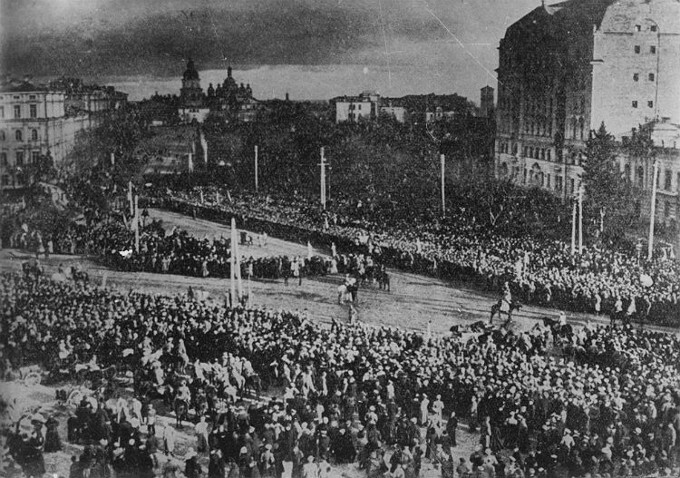 The date for the election of the Ukrainian Constituent Assembly is fixed for January 9, 1918, and the date for its summoning January 22, 1918. A law will be immediately published regulating the summoning of the Ukrainian Constituent Assembly.